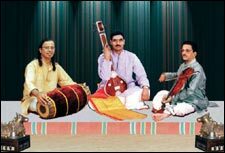 Sangeeta Gaana Yagnam By S S Music Academy is an event that took place on 02-Sep-2006 in Hyderabad. Heard enough? Here's more than enough! SS Music Academy is conducting a 12-hour Music Fest of Andhra Pradesh Telugu Vaggeyakara Keerthana Gaana Yagnam on 2nd September at Ravindra Bharathi, in association with the Department of Culture. 35 Musicians from various Government schools and colleges, Cultural Associations from the twin cities (including SS Music Academy), will be singing the Keerthanas composed by Telugu Vaggeyakaras. The program starts at 9:15 AM with the recital of Pancharatna Goshthi of Sri Thyagaraya, followed by the Keerthanas of Vaggeyakaras like, Sri Thyagaraya, Sri Annamacharya, Dr Mangalampally Bala Muralikrishna, and so on, from 10:00 AM to 7:00 PM. SS Music Academy students will recite their share of Keerthanas from 7:00 to 8:30 PM. A Vaggeyakara is one who himself/herself writes and composes the Keerthanas which he/she sings, or it is sung by any other vocalist. This musical marathon would be inaugurated by Chitra Ramachandran, Secretary for Tourism and Culture, Government of India in the morning at 9:00 AM. In the evening, the chief guest will be M Satyanarayana, Minister for Sports and Culture, and the other special guests are Dr Dharmavarapu Subrahmanyam, Chairman, AP State Cultural Council and Dr A Manjulatha, Vice Chancellor, Potti Sriramulu Telugu University. SS Music Academy was established in Gandhinagar, nine years ago by G V Prabhakar, a disciple of Sishtu Prabhakar Krishna Murthy of Machilipatnam and Oleti Venkatesham of Vijayawada, with the sole intention of spreading music to all aspiring students of music. The academy imparts training in Carnatic Vocals, Hindusthani Vocals, Kuchipudi Dance, Veena and Violin Recitals, Western Folk, Keyboard, etc. G V Prabhakar is a graded artiste of AIR since 1980, and also Doordarshan. Be the first to comment on Sangeeta Gaana Yagnam By S S Music Academy! Just use the simple form below. fullhyd.com has 700,000+ monthly visits. Tell Hyderabad what you feel about Sangeeta Gaana Yagnam By S S Music Academy!